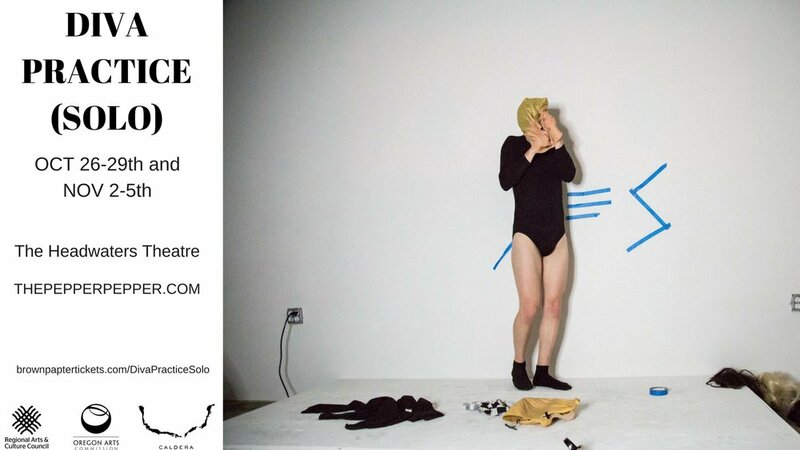 Diva Practice (Solo) is a performance piece about drag queens dancing with uncertainty, because being fabulous takes... PRACTICE! Diva Practice (Solo) is the second cycle of a three cycle performance project by choreographer and drag artist Pepper Pepper. Diva Practice (Solo) is a queer journey into the role of the "soloist" through multi-media projection, dance and drag. Diva Practice (Solo) was developed during a tour of residencies through Oregon, Louisiana, Maine, Texas and Atlanta, with support from RACC Regional Arts and Culture Council, OAC Oregon Arts Commission Professional Development Fund, Caldera Artist-In-Residence Program, The Lucky Penny Workroom Residency, Pelican Bomb, and SPACE Gallery.